Tarek Chemaly: Thomas Kolster - Mr Goodvertising - will be in Beirut! Thomas Kolster - Mr Goodvertising - will be in Beirut! Thomas Kolster, Mr Goodvertising himself, will be in town. I have had the pleasure of talking to him during the round table talk that was held in Amsterdam on the side of the Epica Awards where I was a jury. 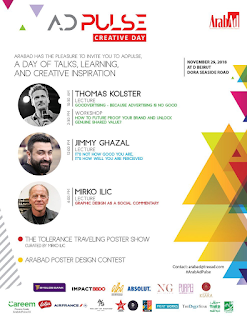 The inverview was published in ArabAd which will be hosting Kolster for a special event among other speakers. Please check the poster above for details. "Opening the show was Danish author Thomas Kolster, from the “GOODvertising” book fame, who went through examples upon examples of brands, which truly tried to do good in their communities and the way they set about doing it. In a private chat with ArabAd, Kolster – when asked about the limit of CSR (Corporate Social Responsibility) and the beginning of goodvertising – said that “CSR is what companies need to do, whereas doing good is what they want to do to solve a problem”. But when confronted with an opportunistic side to brands, Kolster gave the example of American Express, which is the founding partner of Small Business Saturday – a manifestation that supports small businesses in the United States – which “did not come up with this event out of nowhere, actually ever since the seventies American Express was involved in its community so much and it was donating a cent from every transaction that used American Express cards for the rehabilitation of the Statue of Liberty in the United States”. Another example Kolster volunteered was the Nike Flyknit, which actually required much less sewing, assembly and eventually raw materials – which produced much less waste – when compared to regular sneaker production. But do his projects have tangible effects on the ground? ”I have done projects in Mozambique, one hairdresser had one bucket of water for all their clients of that day. In some nations saving and recycling are part of the DNA of the population, and it is up to us to take them on that journey further,” concludes Kolster."